If you are looking for information on the Port City Java franchise business opportunity, Port City Java franchises or Port City Java franchising, then you have come to the right place. 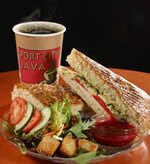 Since 1995, Port City Java has been serving its customers great coffee and espresso drinks, fresh juices and smoothies from the juice bar, fresh baked pastries, hot Panini sandwiches, soups, and fresh salads. We have stores in multiple states along with operations in Iceland and Germany. Our experience and proven concept provides the franchisee a strong opportunity to succeed in the coffee café industry, which is growing exponentially. The Coffee House/ Café Concept has re-emerged as a leader in the hospitality industry, because it provides a venue to relax, have fresh upscale beverages and foods, quick counter service, soft café seating, and quite simply "Excellent Arabica Bean Coffee!" 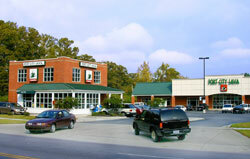 Port City Java Cafes, with their wired & wireless internet services are gathering places for neighbors, business people, travelers, and students, generating tremendous loyal repeat business. We have an "All Day Approach" to our business. We have based our concept on 3 main pillars, with the goal of generating sales throughout the entire day, everyday. 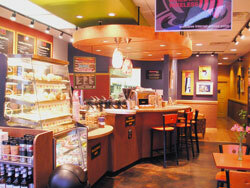 Fresh Roasted Coffee and Espresso as well as on site baked pastries. Fresh Fruit Smoothies and Freshly Squeezed Juices from our juice bar. Hot Panini Sandwiches from our Panini Grill and soups and salads. By offering products that the customers desire throughout the day and evening, we aim to generate revenues throughout the entire day. Use of the trademark Port City Java® name. Proprietary coffee products from our Port City Java® Roasting Facility. As a result, our franchisees can be assured of Freshly Roasted Coffees, which are procured from estates worldwide and roasted by our Roast Master to Port City Java® specifications. Corporate Purchasing Power and National Accounts with Vendors, relieving the Franchisee of having to negotiate. Equipment and furniture specifications and approved vendors. Interior designs, including space layout, complementing colors, and a designed atmosphere. In house baking program, generating fresh products with less waste. Manuals, providing instructions for procedures, recipes and marketing. Training. We require initial 10 day training. In addition, phone consultation and email consultation is available. On going product devolvement. Whether it's our Slushin Joe™, or Coffee House Classics Sandwich Program, we are constantly developing new products and programs for our franchisees, allowing franchisees to devote full time to operations. Total Support. We will never forget the Port City Java® Brand belongs to all of us! We are only as successful as our Franchisees. We are ready to put our full resources behind you to make your venture a success. Whether this represents another concept for your organization, or this is your first venture, we welcome you to explore the possibilities of successfully operating a Port City Java.